Arrival in Tbilisi, Georgia. Your room will be available after 14.00 hrs. You also have the option to arrive early morning of the 14th. In that case your room will be at your disposal to take a short nap. There is no official program on this arrival day. Briefing at our hotel. We will stay at hotel Irmeni, centrally located and just 15 minutes’ walk from the old city center. 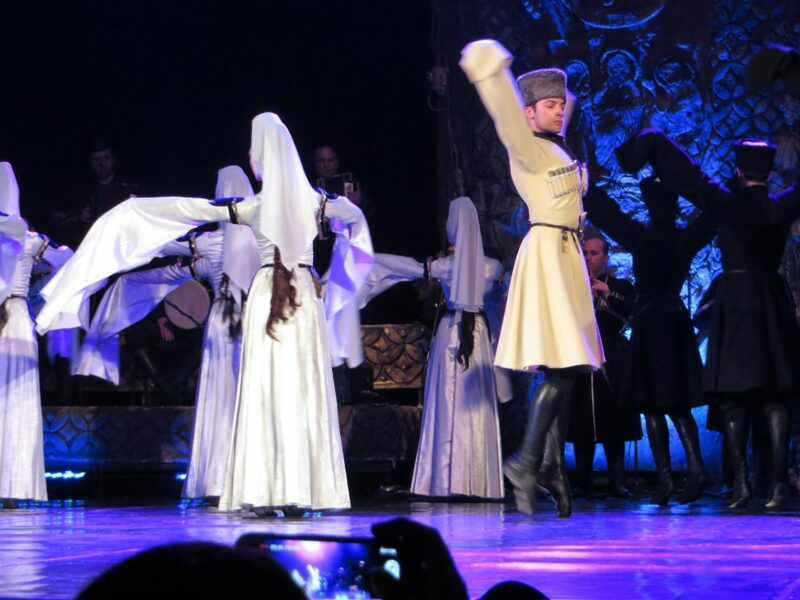 This morning we might have a chance to see a rehearsal of the professional Irisioni Ensemble. Near their studio there are coffeeshops and restaurants to have lunch (not incl.) 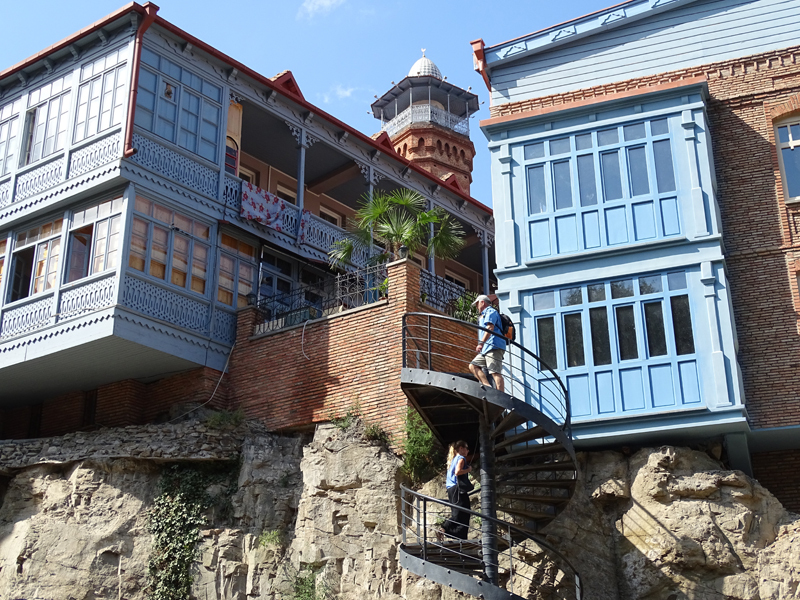 The bus will bring us back to the old city center to get acquainted with Tbilisi on foot. We will have dinner in Tbilisi (incl). We will have an early departure (8.00 hrs.) to visit the northern part of Georgia travelling the Military Highway towards the Russian border. We will make a stop in Gudauri to buy yourself a lunch in a supermarket. 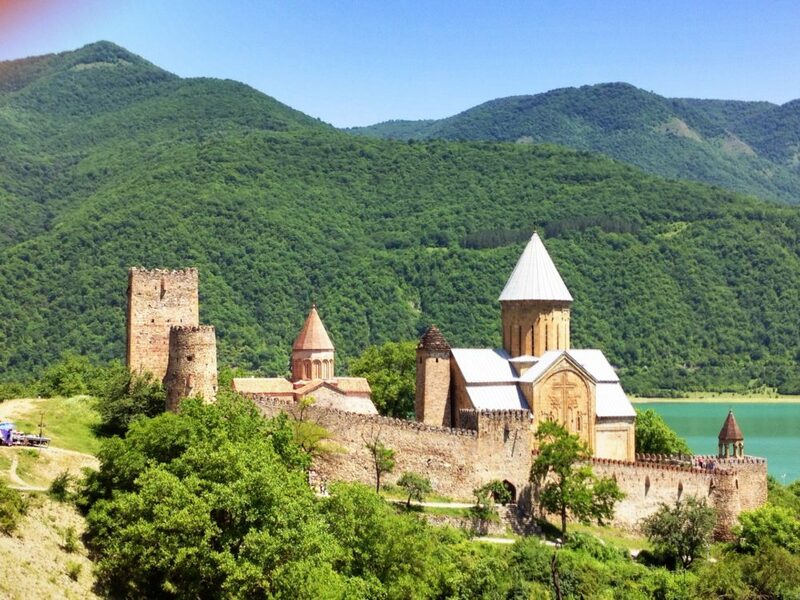 During our tour there is a guided tour at Ananuri castle prior to arriving in Stepantsminda. There we will change our bus for smaller 4 wheel drive cars to continue another 8 kilometer on a non-paved road towards Gergeti Monastery. It is the most famous sightseeing spot in Georgia, depicted on many post cards for the fabulous view on the surrounding Kazbeki mountains with a height of 5047 meters. Enjoy this stunning view in the dim sunlight of the late afternoon and hike in this impressive landscape. We will have dinner (incl.) on our way back to Tbilisi. The bus will drive to the eastern part of Georgia to visit Sighnagi, a small town in the middle of the wine district at a distance of 110 kilometers from Tbilisi. There will be some free time for a walk in this beautiful town, situated on a hill and surrounded by a big defense wall. Visit the wall and you can buy yourself a lunch in Sighnagi. Not far from Sighnagi we will make a stopover in a vineyard and meet with Zedashe ensemble, a choir which has performed in several foreign countries and which also will do some dancing. Dinner (incl.) is complemented by local wines. 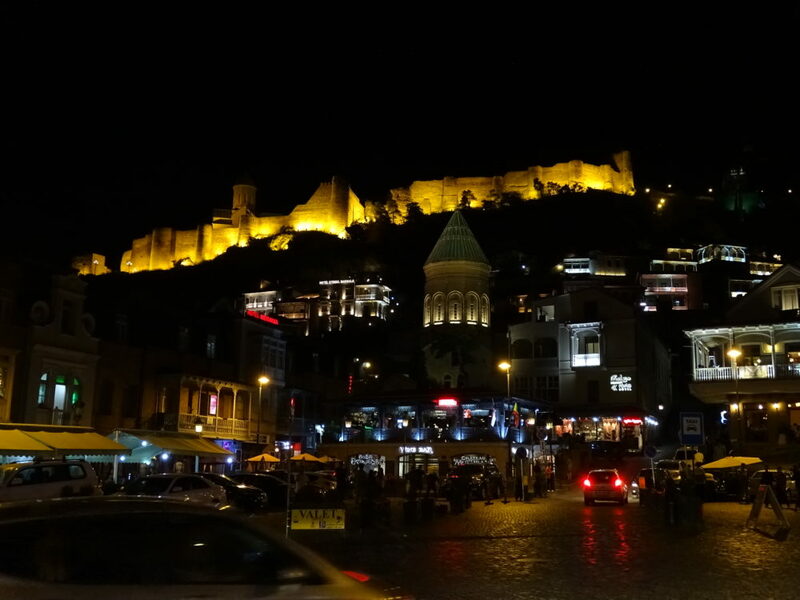 After dinner we will return to Tbilisi. We will have an early departure (8.00 hrs.) and will partly travel on unpaved roads amid an impressive landscape to the village of Udabno, located a little over 50 kilometers from Tblisi. There is a nice small restaurant in Udabno where we will have lunch (incl) and later meet with the choir. Udabno is not far from David Gareja Monastery, nominated as UNESCO World heritage, and dating from the 6th century. This monastery is partly build inside the mountain and it is the eldest monastery in Georgia. Archeologists have found objects from the Bronze and Stone Age. After visiting the monastery with a guide there is a beautiful hike to caves, ancient monk dwellings on the other side of the mountain. The hike is not easy and partly steep and uneven. Part of the group might like to do this challenging hike and will be rewarded reaching a complete town of caves decorated with frescos overseeing the plains of Azerbaijan. The alternative is to visit the monastery and walk back on the main road for about 3 kilometers where the bus will pick you up and bring you back to Udabno. Hikers will return later by bus. 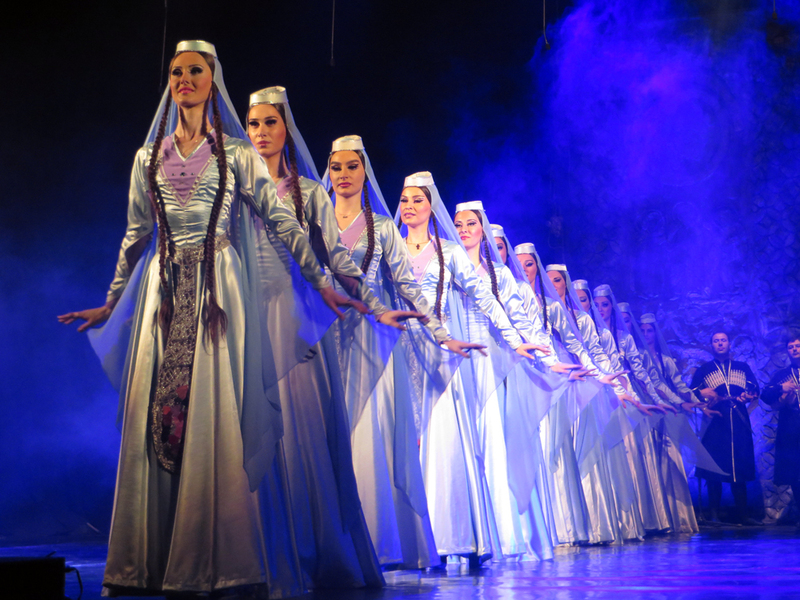 Georgia is famous for its polyphonic songs and we will meet K’asletitla, the local choir. It is particularly interesting to meet them because the population of Udabno originates from the very remote and wild region of Svaneti near the border of Cherkessia and Kabardino. Even nowadays this region is very isolated and difficult to reach. As a result of this isolation and its harsh winters people have kept their own culture. We will have dinner (incl.) together in Udabno before returning to our hotel in Tbilisi. Check out and departure: 9.15 hours. If the professional dance company is in town and rehearsing, we will try visit the studios of the Georgian National Ballet (Sukhishvili). You have time to have lunch in this part of Tbilisi before our guided visit to Svetitskhoveli Cathedral, located in the historic town of Mtskheta, Georgia. A masterpiece of the Early Middle Ages, Svetitskhoveli is recognized by UNESCO as a World Heritage Site. Known as the burial site of Christ's mantle, Svetitskhoveli has long been one of the principal Georgian Orthodox churches and is among the most honored places of worship in the region. You will have a guided tour of the Cathedral and free time to browse around in Mtsheta and try the taste of Khinkali - a Georgian dumpling - in one of the many restaurants around the Cathedral. From here we will travel by bus to Gori, the town where Stalin was born and visit the Stalin Museum. Our overnight stay will be in Borjomi, where you can have dinner. For decades Borjomi is a touristic town in a beautiful area surrounded by a National Park and famous for its spring water. Locals will offer some handicrafts for sale. Today we will visit the museum and complex of Uplistsikhe, an ancient rock-hewn town dated from the early Iron Age to the Late Middle Ages. Uplistsikhe is identified by archaeologists as one of the oldest urban settlements in Georgia - Uplistsikhe once housed 20,000 people. You will need good non slippery hiking shoes because the complex is built of rock-cut structures of different elevations. There is a small cafetaria to buy yourself a snack for lunch or maybe you prefer to buy yourself a lunch before our departure in Borjomi. Late afternoon we will arrive at Hotel Lomsia in Akhaltsikhe where we will have dinner (incl) and will stay for 2 nights. 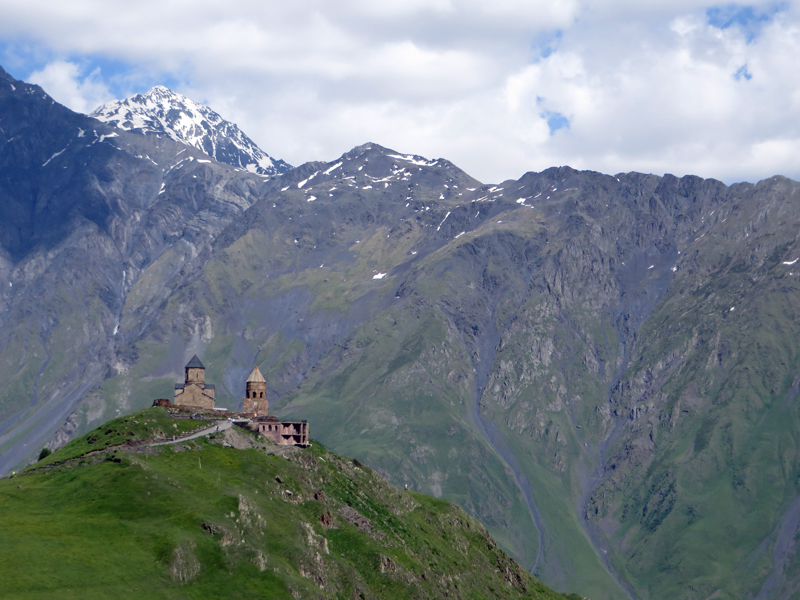 Small buses will bring us to Saphara Monastery where monks still reside, located about 15 kilometres from Akhaltsikhe. It is not meant as a touristic site, so we have to respect their privacy and admire its beautiful frescos in silence. Back in Akhaltsikhe we transfer to our big bus and continue to Vardzia. Upon arrival in Vardzia we will first have lunch (incl.) at a scenic spot near the river, an excellent place to relax and enjoy fresh fish from the river. 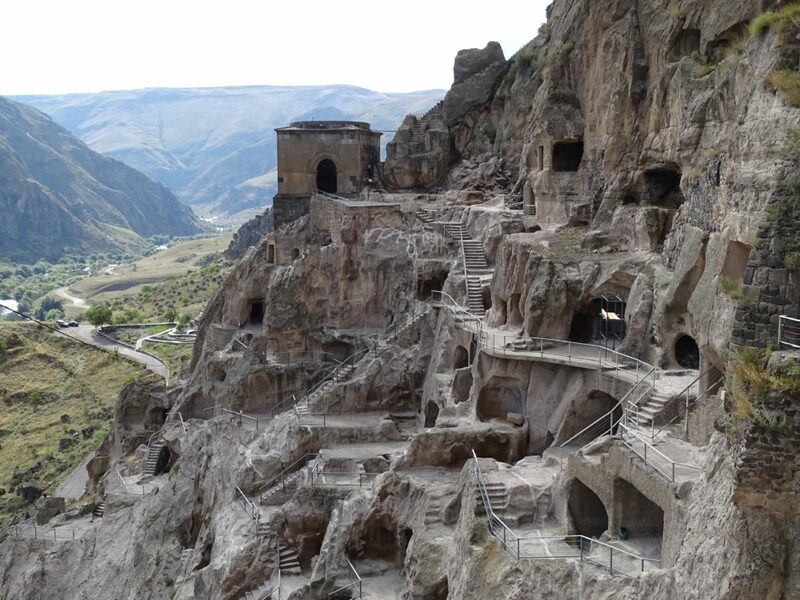 After lunch we will visit nearby Vardzia complex, an ancient cave city carved in a rocky mountain slope. It once covered thirteen stories and accommodated more than 6000 caves, where monks lived. It was accessible via tunnels near Kuria river. In 1283 a.D. an earthquake destroyed 2/3 of the complex, exposed the caves and caused a collapse of the irrigation system and terraces on which crops were grown. In present times the church and bell tower can be visited and remnants of amphoras - meant for storage - are visible in deserted caves. Even nowadays some monks still live in the caves. Checkout at 8.30 hrs. 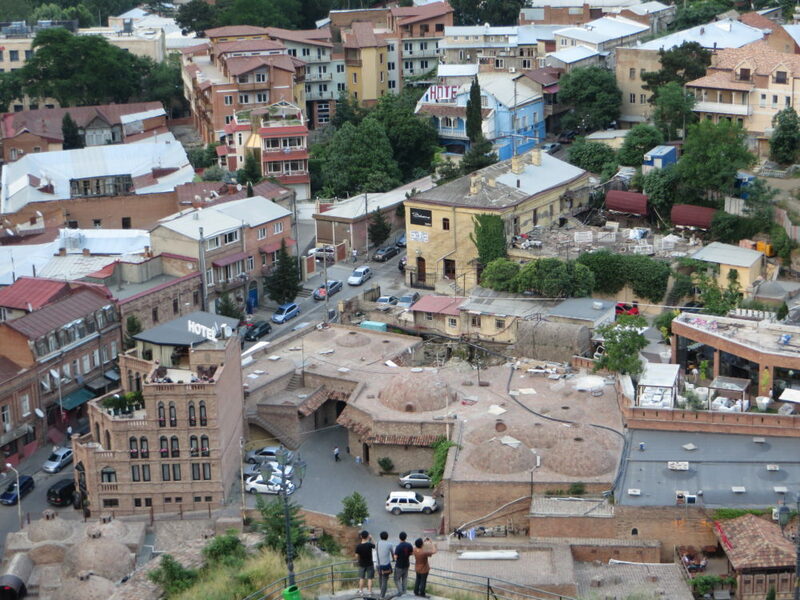 Today we will go back to Tbilisi and check in at our former hotel Irmeni. We will stop to have lunch in Gori (incl.) You have a free night, no dinner provided. Free day in Tbilisi. You have the opportunity to visit the National Historical Museum, which has an extensive collection of fabulous antique jewelry and costumes. A visit to Narikala Fortress which can be reached on foot or by cable car offers a splendid view over the city and Mtrkvari river. It dates from the 4th century and has been expanded in the 7th century. If you like to shop you can walk to the old city center or to Dry Bridge Market along the river, which offers a mix of second hand Soviet paraphernalia and vintage items. At 18.00 hrs we will meet in our hotel to walk to restaurant Mazpindzelo for our farewell dinner. You will have a transfer to the airport or leave by bus to extend your tour to Armenia. - any personal expenses such as telephone call, laundry, souvenirs, etc. The minimum required amount of participants is 15 persons.